Thunderbird Resorts invited us bloggers in a familiarization tour of their resort in Poro Point, La Union and took us to the tourism sites in the surrounding area of San Fernando and Luna. It was an opportunity to visit what I wanted to go to: the Pindangan Ruins and the Luna watchtower. It was raining when we arrived in San Fernando from Luna’s Spanish colonial era church and watchtower. Tired and weary from the day’s trip around the province, we were hungry and anything offered as long as its food is always welcome. Halo-halo de Iloko in San Fernando has been written much about, primarily because of their star dish, the halo-halo, a cold dessert consisting of different fruit and processed fruit ingredients, shaved ice, leche flan, ice cream and milk served on a tall glass. Here, if one gets the bigger order, is served on a big and tall glass. About half is filled with sweetened ingredients while the rest is with shaved ice. It is topped with cornflakes, a scoop of ice cream and a few grated cheese which reminds on of the popular fare of Tiwi in Albay. As to taste? Just delicious! The different textures of sweetened bananas, the smooth ube halea, the crunchy cornflakes, creamy leche flan coupled with the rest of the ingredients just make this halo-halo version very memorable. Its quite sating too and a bit heavy on the tummy. Even if it rained outside, I finished this one. Other dishes served us were multicolored prawn crackers or kropek and okoy. In most places, the latter dish is typically unshelled small shrimps in a batter and deep fried and eaten dipped in vinegar with chilies. At Halo-halo de Iloko, they enhanced the typical okoy. Their version is healthier and fiber rich which is made from squash shavings, carrots and added with longganisa (local sausage), or tuna, or bacon and, of course, shrimp de rigueur. Dip it in their special vinegar and its one crunchy and delicious fare. Their special vinegar, also sold at the restaurant, also gives life to the prawn crackers that were served us first to stave off our hunger and while waiting for the halo-halo. 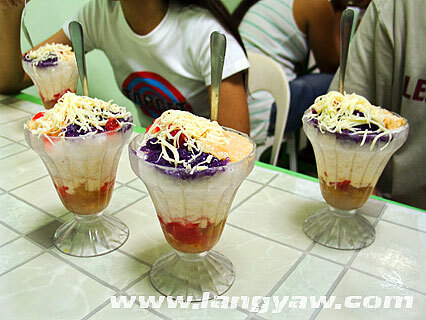 Halo-Halo de Iloko is one place in San Fernando, La Union that a traveler should visit. Other than the dishes mentioned above, they have other meal items available, all at affordable prices. And, oh, by the way, their interior is rather eclectic and it’s a riot of decors. Depending on ones taste, it might be too tacky or interesting for you. P. Burgos cor. Zandueta Sts. Halo-Halo de Iloko ba ang name mismo ng restaurant sir? So this is in SF, LU mismo. Yum! Now I’m starving, haha. South Korean has a similar dessert called pot binsu. It’s shaved ice, various fruits, sweetened red bean paste, and sometimes whipped cream or other decorative stuff. Quite good on a hot summer day, I’m told.